In my classrooms, I have noticed that more and more students are coming to the study of religion with preconceived conceptions about different religious communities, most frequently, and consequentially, Islam. My sense is that many students in my World Religions courses have a sympathetic imagination about the religions of the “East,” and a positive familiarity with Christianity, even if they aren’t part of a Christian community. However, when it comes to learning about Islam, some students have slight anxiety about Muslims or, more rarely, an established intolerance of the tradition. As an expert in the study of Islam, I feel a responsibility to address why students have placed Islam in an exceptional position, seeing it as a tradition very different from others. Therefore, in addition to outlining key themes and activities about Islam in my World Religions courses, I set two goals: to dismantle the idea that Muslims pose a new and unique threat that legitimizes an unprecedented reaction in American religious history, and unpack why many of my students have come to this conclusion in the first place. As others have noted (Youshaa Patel, Debra Majeed, Sufia Uddin, Elliott Bazzano), we live in a time of rising levels of hateful public rhetoric towards Muslims, support for discriminatory policies, and general demonization of Islam. It’s easy to conclude that students’ deep-seated assumptions about Muslims are shaped by dominant media representations of Islam, which are usually sensational, one-sided, or incomplete at best. What’s key for my students is to understand how their media-informed prior knowledge has shaped their views about Islam. If students do not engage Muslims in their own experience–as their neighbors, doctors, peers, etc.–how can they unlearn their biases? How can we disrupt students’ implicit biases and reframe their understandings of Muslims? Media literacy is an important component of my World Religions class. I begin by thinking about news media because for many of my students the news is seemingly unbiased and simply an unmediated account of the world out there. Jolyon Mitchell’s essay, “Religion and the News: Stories, Contexts, Journalists and Audiences (from Religion and the News, eds. Jolyon Mitchell and Owen Gower (Farnham: Ashgate, 2012), has been successful in revealing the various constraints of print and visual news media given the limits they create for its ability to convey stories with rigor and detail. Using this essay alongside several sources about a single current event effectively demonstrates how the structures of this medium require the use of labels, formula, and clichés (i.e. stereotypes). This primer on news media leads us to critically deconstruct representational forms that are clearly more produced (i.e. television and film, political campaigns, literature, etc.). Moustafa Bayoumi’s book This Muslim American Life: Dispatches from the War on Terror (2015) is a useful source for this type of genealogical approach (cf. SherAli Tareen). Bayoumi outlines key aspects to the construction of the homogeneous portrait of Islam and Muslims that dominates mainstream media. 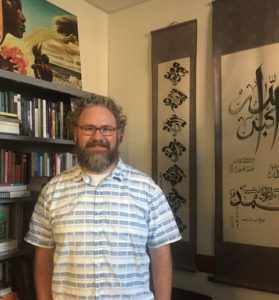 He shows that the production of Islam in the American imagination includes several components: the effects of anti-Muslim political discourses, the production of knowledge about Muslims by so-called “experts,” policies of governance and policing, and an archive of images in popular culture. He effectively demonstrates the intersections of various forms of representation and their social consequences in lived realities. Through this focus on how Islam is envisioned in America, I find that frequently stereotypes remain invisible to students and they aren’t convinced that social policies or practices facing Muslims are unwarranted. Therefore, an important question is what histories do I need to provide in order to make students sensitive to biased representations? I place Muslims in the American historical landscape in order to highlight that anti-religious discrimination is recurring and typical. I want students to see that there is an extended history of prejudice and intolerance of religious minorities in the United States. Bayoumi aids this process by covering the long history of Islam in America, going back to the colonial period. I pair this with Peter Gottschalk’s book American Heretics: Catholics, Jews, Muslims, and the History of Religious Intolerance. By linking contemporary anti-Muslim racism with the legacy of American exclusion and religious persecution, I show students that oppression of minority groups is nothing new. Gottschalk clearly describes the parallel systems of oppression and operations of exclusion that dominant American religious groups have wielded over minority communities across our history. My hope is that by seeing the effects of discrimination historically, students will be inclined to denounce and act against similar forms of oppression that exist today. The final pedagogical piece is assignments that draw students into media production, thus highlighting the restricted nature of specific mediums, the structural boundaries within which media producers work, and how difficult it is to create content that is nuanced and complex. I find that responding to real life scenarios rather than abstract essay questions generates student knowledge about Muslims in robust and valuable ways. Writing prompts meet students within their own social context (i.e. the university, the regional community, other institutions, etc.) and require them to reflect on the current reproduction of issues we covered in class. For each assignment, they need to respond to local or national circumstances and justify their argument. Some of the tasks are very immediate and personal, such as outlining a conversation with friends about classes and discussing the assumptions their peers might have about Islam. Other assignments include activities such as responding to a vitriolic opinion-piece in the local newspaper, giving a presentation about Muslims to non-Muslim interfaith community members, reacting to a campaign to stop the construction of a new mosque, or attending a meeting with the University Board of Trustees to argue for internationalizing the curriculum. Overall, requiring students to address real life scenarios forces them to respond with clarity and nuance. It also empowers them to confront stereotypes and their social consequences in their local settings. Placing these new tasks within their acquired knowledge of the extensive history of American religious discrimination and the ways in which Islam is produced in an American context (as a reified entity) dismantles many of their previous suppositions about Muslims. Ultimately, it also reveals some of the rhythms of United States religious history that still play today. Kristian Petersen is an Assistant Professor in the Department of Philosophy & Religious Studies at Old Dominion University. He is the author of Interpreting Islam in China: Pilgrimage, Scripture, and Language in the Han Kitab (Oxford University Press in 2017). He is currently working on a monograph entitled The Cinematic Lives of Muslims. He is the editor of the forthcoming volumes Muslims in the Movies: A Global Anthology, New Approaches to Islam in Film, and the Bloomsbury Handbook of Islam and Popular Culture. 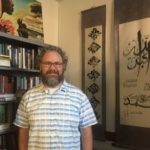 He is the Design Architect and Curator of the Women of Islamic Studies project, a crowdsourced database of women scholars who work on Muslims and Islam. He is also the host of the New Books in Religion and New Books in Islamic Studies podcasts.